Mobile websites are not the same as desktop websites. A mobile website is usually pared down so it’s functional on the much smaller device — whether that’s your smartphone or a tablet. If you want to build a mobile version of your own website, you can use your existing domain with some common, minor adjustments. If you want to keep your existing web domain but create a specific mobile address, you can follow a couple of conventions. This approach is useful if you want to hold on to the use of your existing .com site. It might involve some extra keystrokes on the part of the user, although most mobile browsers default to the mobile site. Although some host providers may charge you for extra third-level domains, only a small amount of configuration is required, and of course you don’t need to buy a new domain name. Again, a directory might involve more typing for the user, but it doesn’t require you to configure anything special on your web server. Almost all of the stuff you can find on the Internet now, whether you view it, download it, or generate it as a user, is well suited to be delivered by fast Internet technology: broadband and cable networks. But all that cool Internet stuff may not be as well suited to a mobile phone — or as appealing, if it isn’t produced in the right format or context. That’s because the similarities between the mobile Internet and the wired Internet are (for the most part) skin deep — and the differences are complex. Ten years ago, the challenge for wireless carriers, mobile phone manufacturers, and Internet-based content companies was how to give customers access to the huge amounts of information and services available on the Internet on the go. A smartphone, tablet, gaming console, or other portable device that can go online: First and foremost, you can’t jump onto the mobile Internet without a mobile phone or other mobile device. A data plan: To use the mobile Internet, you have to have a data plan from your cell phone provider. A made-for-mobile Internet site is a website that’s streamlined and designed to work on mobile devices. The sites are most easily identified by their URLs —often, the www part has been replaced with an m — for example, m.miniusa.com versus www.miniusa.com, and m.dummies.com versus www.dummies.com. Full Internet sites often have too many graphics and too much information for mobile phones and other handheld devices to access and display in a practical way. Accessing the pure Internet on a mobile phone might not be the best use of a person’s time and money. 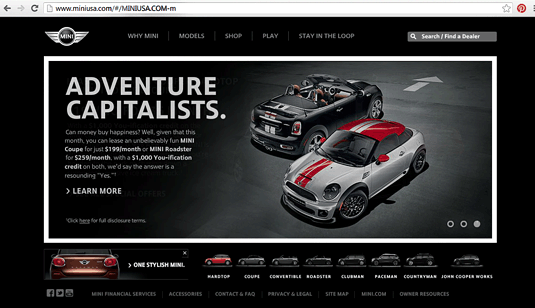 The full Internet website of Mini Cooper. Browse more easily on your mobile device: Because a mobile device has a small screen, no large keyboard, and no “real” mouse, a made-for-mobile site has pared-down navigation, lets you enter text easily, and is designed to fit on a smaller screen. Access highly condensed, small bites of content and services on the go: The sites are specifically designed and developed for your mobile phone, offering just the information you’re most likely to be looking for. The next figure shows you Mini Cooper’s mobile website. Notice the differences? 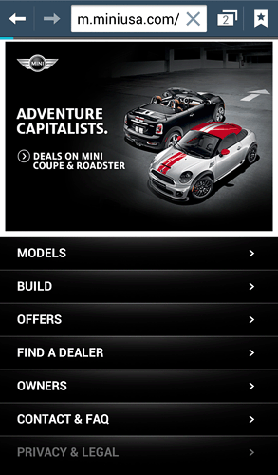 The Mobile website of Mini Cooper. The best use of the mobile Internet is to receive the information, applications, and services that work best on mobile devices when you’re away from your computer. There’s no reason to overload your mobile gizmos with everything you can see on the Internet. The mobile Internet is the information equivalent of a fast snack on the go. At a bus stop, in a taxi or train, waiting for a plane or a friend, before a business meeting, you can snap up tidbits of useful info.